A good drumstick bag is critical for organizing and carrying your stuff. They’re your best friend when it comes to ensuring you don’t forget anything when you gig, practice, and record. You don’t need to spend too much on one of these, but drumstick bags are essential for every drummer. There are a LOT of different bags out there… some good, and some not-so-good. The Promark Transport Deluxe Drumstick Bag is one of the best drumstick bags available, especially for the price. Because it comes loaded with some great features that most drumstick bags neglect. 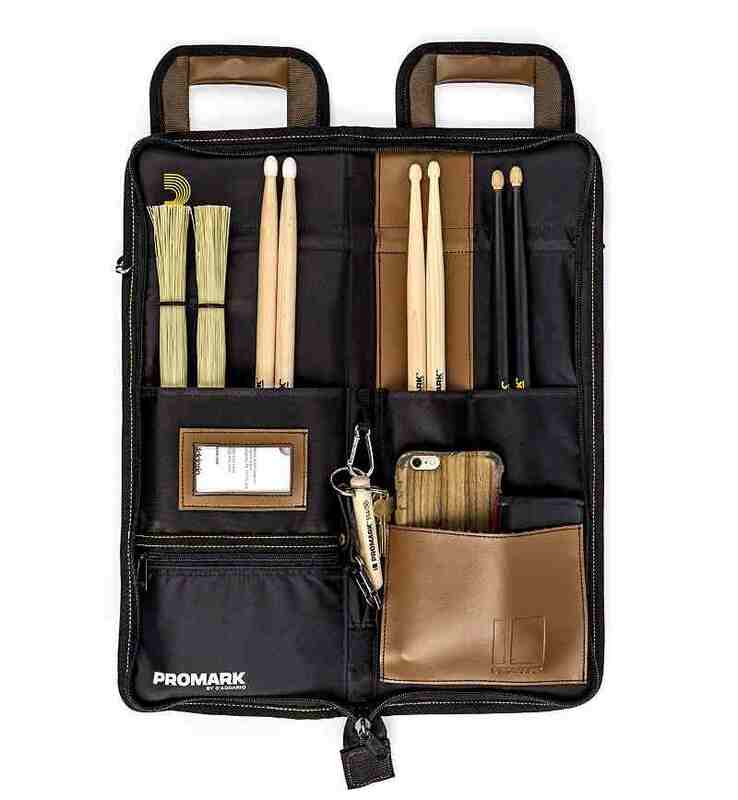 When you gig, you need to carry much more than just a few sticks… It seems like Promark understand this: They’ve built their drumstick bag with real drummers in mind, which is why the Transport Deluxe gets our pick as the best drumstick bag available. 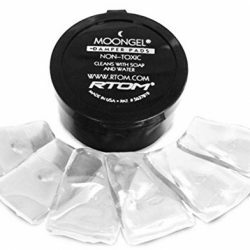 Importantly, there are some easy-access pockets to store your phone, wallet, in-ear monitors, spare cymbal felts, moongels, and other stuff. 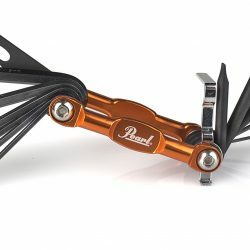 There’s a built-in carabiner clip which is perfect for attaching your drum key (or car keys) for quick and easy access. There’s also a big outer pocket, magnetic carry handles, adjustable shoulder strap, pen holder, card/ID slot, and separate stick compartments to keep things organized. This drumstick bag can comfortably fit at least 7 pairs of sticks (or a lot more if you really cram them in). 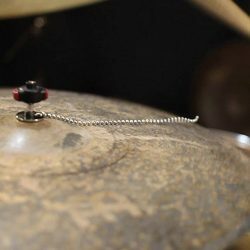 A really cool feature is the built-in retractable metal floor tom hooks, which pull out to easily attach the bag to the side of your floor tom. If you like to place your bag elsewhere, they’ll retract back into their hiding place so they don’t get in the way. On top of all of this, it’s also a great looking and well-built drumstick bag that can handle any abuse you throw at it. The zippers and materials are tough, which is handy when you’re throwing this thing in your hardware bag or constantly travelling with it. If you’re deciding on the best drumstick bag to buy, Promark’s Transport Deluxe drumstick bag won’t disappoint. I’ve used a lot of drumstick bags over the years, and this is my favourite. Seriously, if you find a better bag, get in touch. 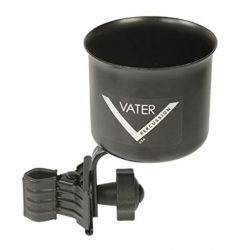 Make sure it comes with floor tom mounts. Buy some carabiner clips to clip on your drum key / torch / swiss army knife / tools / tape / etc., so everything is in the one place and easily accessible. The more pockets and extra storage space, the better… The more you play, the more you’ll find yourself needing extra little pieces of equipment and spare parts. We love the Promark Transport Deluxe Drumstick Bag so much, it’s featured in our article covering the best gifts for drummers. Check out the other products we’ve included in our huge guide on the best drum gifts and accessories available today.